Congratulations to Karel Jack, who won the BPPC Vonage Time to Call Promotion!! 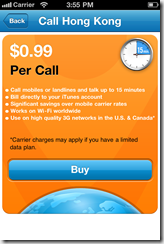 Karel will receive a brand new 32GB iPad 2 and $15 iTunes gift card to place calls with Vonage's Time to Call app!!! Enjoy!!! 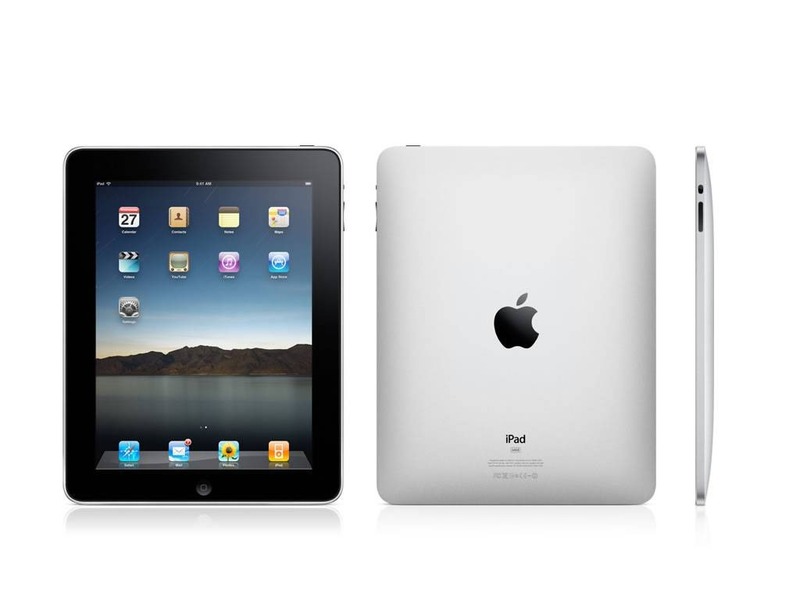 We are happy to announce that we will one of 75 different websites giving away a 32GB WiFi iPad 2 as part of Vonage's Time to Call Promotion. 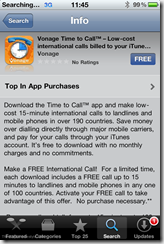 To read our review of Vonage's Time to Call app head here. A maximum of 4 entries allowed per person any more and you will be disqualified. This contest is considered open until 05:01 AM Eastern Standard Time on August 25th, 2011. All entries after this date and time will be considered invalid. This contest is only open to residents of the United States (sorry about this, folks). The winner of the contest will need to provide a valid US shipping address and email. 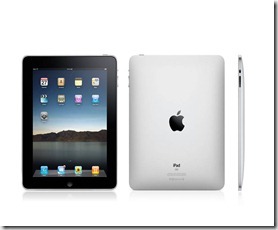 Note: The Grand Prize of the iPad 2 will be given in the form of an Apple giftcards for $700, so you could apply your gift card to any Apple purchase or upgrade to a different version Ipad2 if you prefer. You can read more about the participating sites and their giveaways, by clicking here. Giveaway begins August 21st, 2011 at 7:01 PM PST and ends at 5:01 AM EST on August 25th, 2011. Winner will be notified via email, and posted here when verified. Entries valid within the US. Winner has 48 hours to claim their prize or another winner will be drawn. Prize will be transferred via the sponsor, Vonage. Twitter, Facebook, and Vonage are not directly associated/endorsed with the administration of this contest and all information given is done voluntarily via entering this contest. 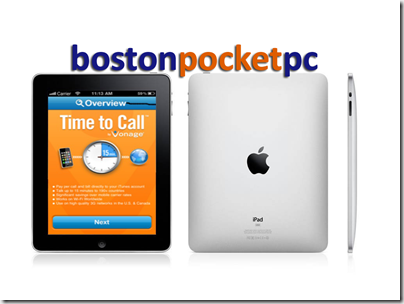 All decisions on the winner in accordance to the rules will be made by the staff of Boston Pocket PC. Each site will be giving away one (1) iTunes gift card for $15 for the readers to get for use with their device and one (1) Apple gift card for $700 for the Apple iPad 2, 32 GB. The prize will be distributed to each contest winner in the form of an Apple gift card. In total, there will be 75 participating sites, each one giving away a 32GB WiFi-enabled iPad2 and a $15 iTunes giftcard to use to place calls with Time to Call. As required by the FTC: we have not received any monetary compensation for this post.We have only received product samples to facilitate the writing of articles on this site. All opinions expressed are ours and ours alone. 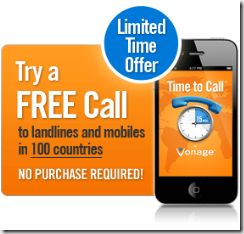 Back in the day I used to be a Vonage customer, due to its free national and international calling we had for both a home business and personal use. At the time for us it was the best and cheapest phone service to use, but as we sold off our business we no longer had a need for the business line and we were offered free IP service via our Comcast bundle. 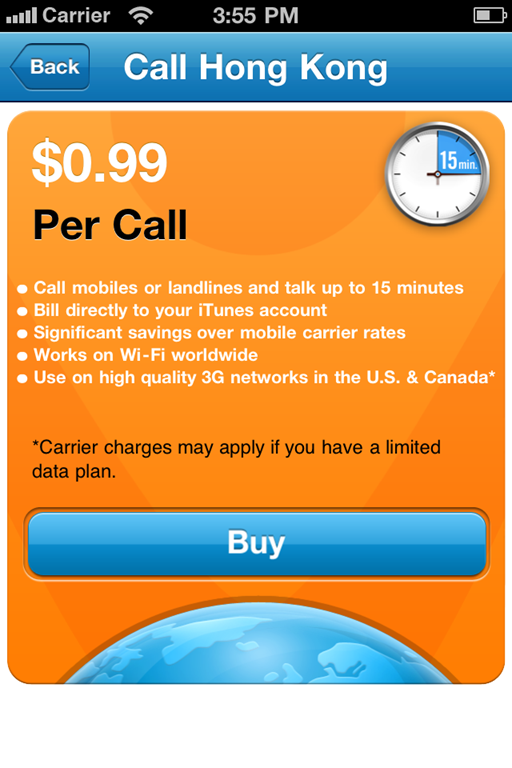 I still miss the ability to make international calls and Vonage now offers an affordable alternative to make international telephone calls without having to be a Vonage customer, but as a pay as you go customer. One of the downsides of having an iPad or iPod Touch is that there is no way to make a phone call, unless it was via Skype or or some other application that just didn’t quite have the sound quality of an actual phone call and most calls experienced buffering and dropped calls. 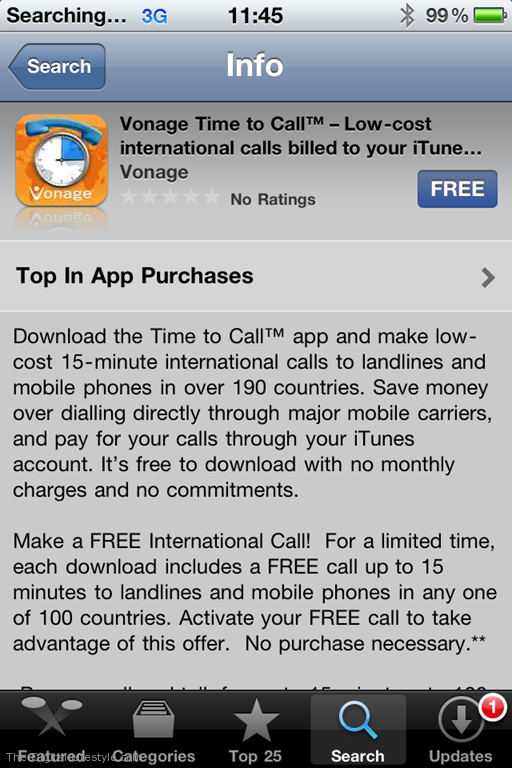 Vonage’s Time to Call App for iPhone, iPod touch and iPad offers that alternative. 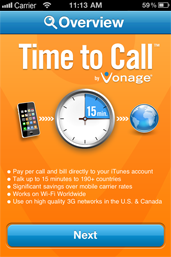 The way Time to Call works is similar to a pay phone (you remember those) in that you purchase 15 minute blocks of calling time via an in-app purchase with the Apple iTunes store(instead of inserting coins) so you don’t have to give Vonage any of your credit card details or personal information. You basically select the country you wish to call and then you are given a rate to make the call which varies from country to country. You then dial the number on the keypad given much like the phone dialer on any modern smartphone today and you should then be connected to any phone number as if you were calling directly from your phone. The app works both over WiFi and 3G (if you device has the capability) remarkably very well and surprisingly very clear. When I tried calling several a few family members via the Time to Call app that are located in various countries throughout the world, each call was as clear as if I had the call on my standard telephone line. In fact, the quality was very good with no dropped calls, in my opinion and those I was conversing with on the other end said that the call was much clearer than the many Skype calls I had with the same family members in the past with out any of the normal delays or buffering we usually experienced when using Skype. If you travel a lot internationally using this app is much easier and cheaper than purchasing calling cards or SIM cards at airports, kiosks, or hotel lobbies. In the past, that more than likely would have deterred me from even make the phone call. 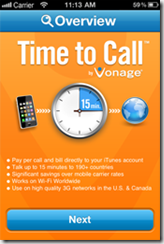 Now as a traveller with the Vonage Time to Call app I now have a very easy to use and affordable option. For a limited time, each download includes a FREE call of up to 15 minutes to landlines and mobile phones in any one of 100 countries. Activate your FREE call to take advantage of this offer. No purchase necessary. **NO PURCHASE REQUIRED! 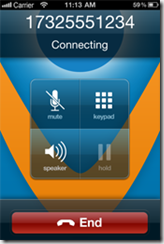 When I first tried the Vonage Time to Call app I was a bit skeptical, but after using it I was thoroughly impressed with the call quality and ease of use. Another thing is if you are good at monitoring your time on your calls, unused minutes are usable for additional calls. I also like the fact that you know how much the call will cost you when it ends and you won’t be surprised when you monthly bill comes around and a few expletives fly as well as an unexpected a hit on your finances. 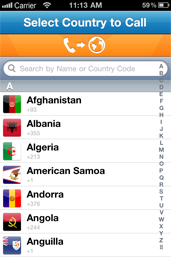 The Time to Call app is free and is available now in the iTunes store here. For more information on the app you can head directly to the Vonage page here. 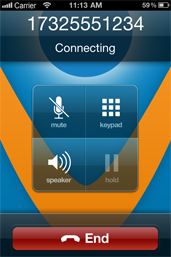 An Android version is coming soon and if you are a Facebook users there is also another option available to you called Vonage Talk Free on Facebook worth checking out. We will also be giving away an Apple iPad 2 as part of the Vonage Time to call contest with 75 other technical blogs. 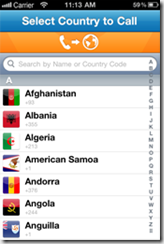 ** Limited time offer for first calls placed to landlines and mobile phones in any one of 100 countries using the Time to Call iPhone app. You must activate your free call before this offer ends by clicking the “Try it for Free” button on the country plan page within the app. Free call expires one year from activation. Eligible countries include: American Samoa, Angola, Argentina, Australia, Austria, Bahrain, Bangladesh, Belgium, Bermuda, Bhutan, Brazil, Brunei, Burundi, Cambodia, Canada, Cayman Islands, Chile, China, Colombia, Costa Rica, Cyprus, Czech Republic, Denmark, Dominican Republic, Egypt, Finland, France, French Guiana, Georgia, Germany, Greece, Guadeloupe, Guam, Hong Kong, Hungary, Iceland, India, Indonesia, Iraq, Israel, Italy, Japan, Kazakhstan, Kenya, Kuwait, Kyrgyzstan, Laos, Latvia, Lithuania, Luxembourg, Macau, Malawi, Malaysia, Malta, Martinique, Mexico, Mongolia, Montserrat, Mozambique, Nepal, Netherlands, Netherlands Antilles, Nigeria, Northern Mariana Islands, Pakistan, Panama, Paraguay, Poland, Portugal, Puerto Rico, Reunion, Romania, Russia, Rwanda, Saint Barthelemy, Saint Martin, San Marino, Saudi Arabia, Singapore, Slovakia, Slovenia, South Korea, Spain, Sweden, Switzerland, Taiwan, Tajikistan, Thailand, Trinidad And Tobago, Turkey, Turkmenistan, Uganda, United Kingdom, United States, US Virgin Islands, Uzbekistan, Vatican City (Holy See), Venezuela, Vietnam, Zambia. At tonight’s meeting Mike Bluestein stopped by to tell us he will be kicking off a new user group in Cambridge at the NERD center focused on mobile development. If his name sounds familiar he has been involved with the community including speaking at the latest Code Camp at the Microsoft building in Waltham and is also the author of “Learning Monotouch”. His meeting will take place on August 24th from 6:00PM-9:00PM at the Microsoft NERD Center. The group will focus on cross-platform .NET development,across all the major mobile platforms: Windows Phone, iOS, and Android. For more information on the event and the group head here.